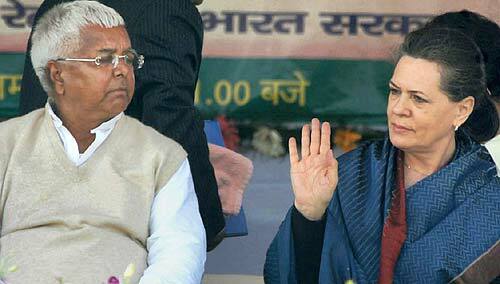 PATNA: Congress president Sonia Gandhi has called RJD chief Lalu Prasad to Delhi next week to discuss certain issues, as per media reports. Reports said Mrs Gandhi called up Prasad and inquired about his well being before asking him to come to Delhi for talks. Both are expected to discuss current political situations in the country and forming a grand alliance to take on the BJP in the next general elections. The issue of presidential elections may also come in for talks, reports said. “She called me up saying she wants to meet him next week. I told her that we would indeed meet next week,” Prasad was quoted as saying in a local news paper on Friday. Prasad said he was indeed worried over the way the “fascist forces” were rising their heads and efforts were on to make religious matters as the political issues in the county. Barely a day before Bihar chief minister Nitish Kumar had called on the Congress president in New Delhi and discussed certain issues. Although it’s not officially known what they discussed, it is believed the two leaders laid stress on forging a broader unity among the secular forces to defeat the BJP. ALSO READ: Lalu considering the option of dumping Nitish?